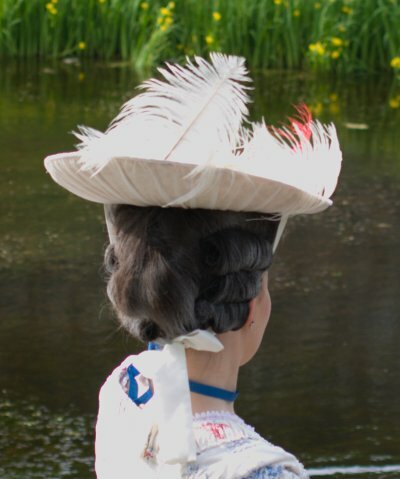 The basic 18th century head covering is a linen cap. It was worn not only for decency's sake (although that was an important thing) but also, for lower classes, to finish and cover hair which might not always be so elegantly done. This basics for this very simple cap, that's really a piece of linen edged with lace, can be found on La couturiere Parisienne. It was hard to find a perfect lace, but at last I I picked an embroidered tulle lace with curved edges. I joined to rows to form a single one, and made the ends curved as the form-made period lappets would have been. The bottom of the cap has a drawnsting, and the edge is slightly gathered. I also worked tiny loops for pins. Straw hats were popular at the period and a good way to protect snow white skin on an age before sun protection lotions. 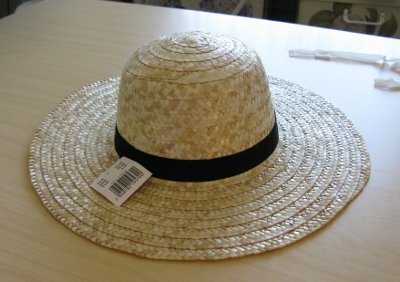 Correctly shaped straw hats can be ordered from several places, but for my first attempts I have used hats purchased in Plantagen. They cost a bit under 4 euros which encourages a bit of extra effort and experimenting. The hat I've used is made of a bit over 1cm wide straw sewn to shape on chain stitch, so it's very easy to take apart. I have opened the hat at the base of the crown and taken off the extra layers of straw until the crown left is of the desired size. Straw can also be molded with steam iron, so I have pressed the crown flat. I have also pressed the removed straw to the desired shape and sewn some of it on the brim to make it match the new smaller crown. Sewing the sides of the crown is more tricky, I have first sewn one or two tiers of straw on the sides of the crown and one to rise from the brim, and then stitched these together. Sewing straw goes fairly easy with industrial sewing machine, and the joining of the brim and crown which will be the most messy part and may require a few attempts will be covered with a ribbon anyway. 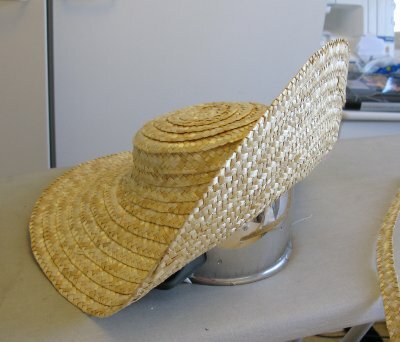 To be honest I must confess that my first attempt on making a straw hat ended up in a trash bin, but subsequent ones have had better success. The Plantagen hat base I've used is fairly stiff, so it's more suitable for sturdy (and durable) than soft, elegantly drooping hats. The brim can be shaped to some extent with steaming, and inserting a metal wire on the brim edge might offer more opportunities for shaping. On a closer look the straw is a bit heavy and not as fine as in fancy period hats, but it's a good, inexpensive option if you are not overly ambitious. For a fabric covered hat it would be perfect. I made my first straw hat to match my pink Pet en l'air. The model dates to the mid century with a small crown. It could be even smaller, though. I remade the crown as explained above and added a few extra rows of straw on the brim edge to make it wide enough. 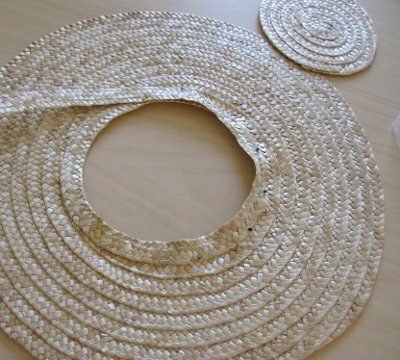 The cheap hat base is decorated with a real moiré silk ribbon found in Stockholm. It made so pretty bows that I wanted two large ones on the hat. Unfortunately the moiré pattern dissappeared with the first summer rain. To make the hat match the dress I added pink flowers between the bows. 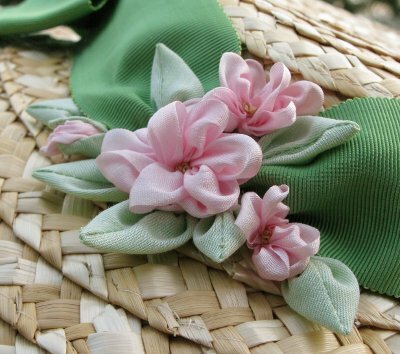 The flowers are made of silk ribbon, the leaves (and also the ribbons for tying the hat) come from Jarno's shirt, which I once ruined by trying to take some extra off from the side seams in a hurry, which ended in my overlock machine cutting a giant hole on the front. Well, at least the poor shirt got some use in the end. 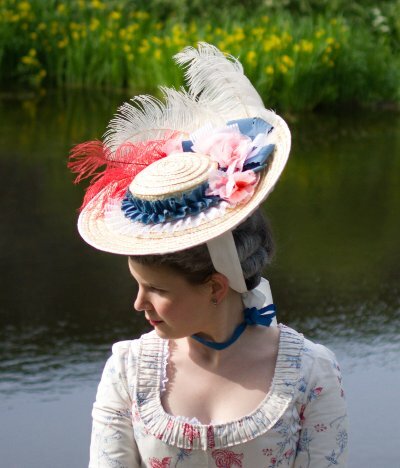 The hat number two in my 18th century millinery career was designed to cheer up my first period dress, the printed polonaise. Like the dress it'd roughly dated to the 1770's, and my vision was to get a fancy feathered pique nique hat. The color scheme was of course a tricolor one according to the dress. As bright red tends to take the attention from everything else I used it sparingly and chose pink for the flowers instead. I added a few tiers of straw on the back of the brim and shaped it with steam to turn a bit upwards. 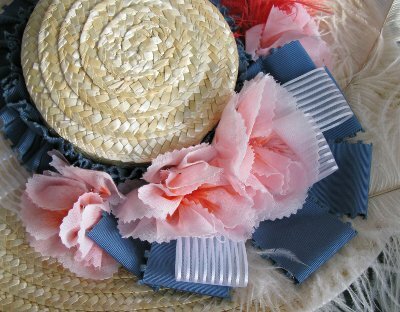 The taffeta ribbons were sewn into the hat on an early stage to help with the shaping. 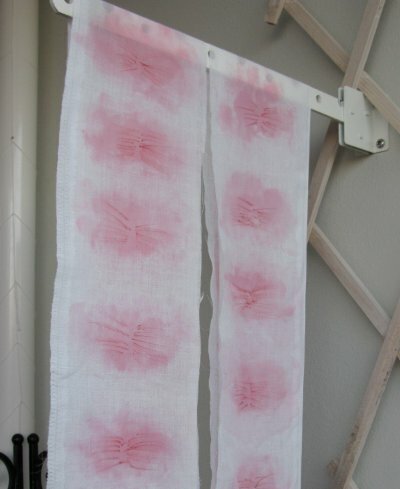 The flowers are made of the remains of the muslin curtains that went into the Chemise a la Reine, and they are painted with fabric paint and half dried red permanent marker. I cut oval pieces and gathered several together to form flowers. Paint stiffened the sheer material nicely, and the pinked edges have lasted without fraying these at least for the few wears the hat has gotten. I pleated and sewed down the white ribbon with machine and gathered the blue ribbon on top by hand. I added some ribbon loops at the back of the hat, stuck the flowers on top, and for the last touch added the obligatory fluffy ostrich feathers. I finished the hat by sewing a wide strip of the same Reine muslin on the brim edge and pleating it inside the crown. This neatly covered all the stitches that had gone into sewing down the decorations on the top. 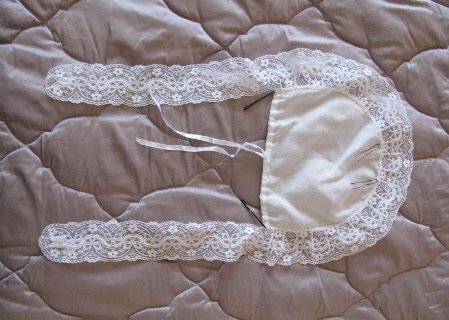 The large stitches on sewing down the muslin are in turn covered with a ribbon glued on the top. The edge of the brim is finished with a bias tape in the same muslin. 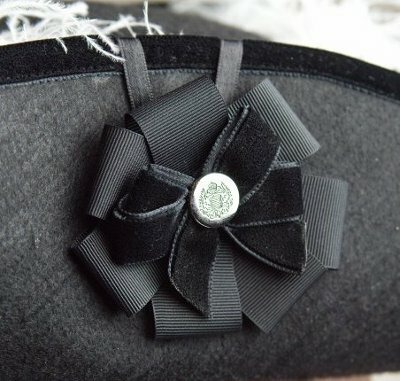 The hat turned out very cute, and like I had hoped it added a new, elegant touch to my dear polonaise. My new riding habit of course needed a masculine tricorn. Due to a busy schedual (once again) I didn't have time to order a really good one, so at last I resorted to buy a cheap fancy dress one which at the first sight looked pretty tacky. Luckily it was at least made of some kind of felt (although very low quality), but there was a not very neatly glued gold braid around the brim. Some patient treating with steam iron help to get rid of the braid and also most of the glue marks. I had a just long enough piece of velvet ribbon left from the habit which became a new brim edging, covering most of the remaining glue marks. I punched holes to the brim and crown to tie the sides of the brim up with ribbons. I also made a cute little cockade and for the last touch added the ostrich feathers. They bring the much needed touch of lightness to the black hat. The hat is men's size and thus a bit large for me, but with big enough hair it goes well enough. The decorations take the attention out of the modest quality of the hat itself. The good thing about it is that for a cheap one it feels at least sturdy and durable. I really like the tricorn and apart from period wear I have also used it as fancy dress wear. 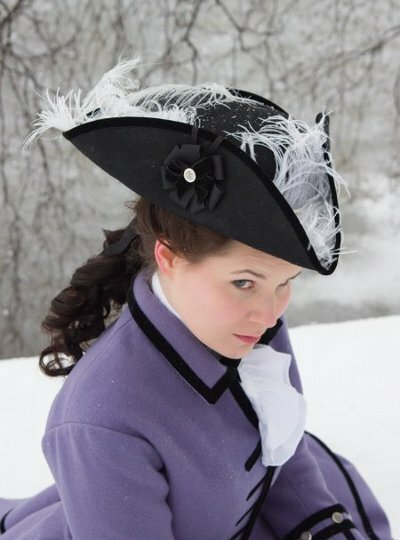 No time or not enough hair to make perfect side rolls for your 1770's Pouf? 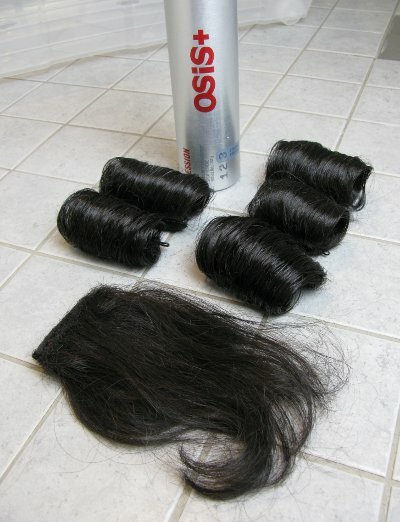 Buy some extra hair sewn to a tape, use some styling foam and hairspray and to really fix them securely sew through the roll. If you can't find a shade that will match your own hair, do what they did at the time too: use powder. Fast and easy to pin into place in a few minutes before leaving to the ball. This solution to eternal "how to do my hair"-problem was inspired by Demode's 1770s Pouf wig tutorial. If you have trouble with your hair keeping a curl (as I do), you can use the same method by curling a piece of extra hair and attaching it to the back of your hair with a clip. You can also treat extra hair with rougher and more effective methods than you would like to use in your own hair regularly.